Discussion in 'General TV & Media' started by mulder42, Sep 1, 2016. The series was sold to ABC in December 2015, created by David Guggenheim, with Sutherland attached to star, and is executive produced by Simon Kinberg, Sutherland, Suzan Bymel, Aditya Sood, and Nick Pepper. Paul McGuigan directed the pilot episode. Amy B. Harris was set to be the showrunner in February 2016, but after the series' official pick-up in May, it was announced she would be stepping down due to creative differences, and that Jon Harmon Feldman was in talks to replace her. In July 2016, Feldman was confirmed as showrunner/executive producer. Kal Penn, formerly associate director in the White House's Office of Public Engagement, will also serve as a consultant for the series. President Tom Kirkman, the former United States Secretary of Housing and Urban Development and the designated survivor who finds himself thrust into the role of President. Alex Kirkman, Tom's wife and an EEOC attorney. Aaron Shore, the White House Deputy Chief of Staff who advises Tom following the attack. Emily Rhodes, Tom's Chief of Staff. Mike Ritter, Tom's Secret Service agent who struggles to protect the Kirkman family following the attack. Leo Kirkman, Tom and Alex's teenage son. Seth Wright, Tom's speechwriter who has strong doubts about his superior's ability to lead the country. Hannah Wells, an FBI agent assigned to investigate the attack who suspects that the perpetrators are not yet finished. Mckenna Grace as Penny Kirkman, Tom and Alex's daughter. Malik Yoba as Jason Atwood, the Deputy Director of the FBI who spars with Hannah as she investigates the attack. Virginia Madsen as Kimble Hookstraten, a conservative Congresswoman and the designated survivor for the rival political party who supports Tom's authority while secretly harboring her own agenda. Ashley Zukerman as Peter MacLeish, an Afghan War veteran and popular third-term Congressman from Oregon who becomes a national hero following the attack. "Pilot" – Kiefer Sutherland stars as Tom Kirkman, a lower-level cabinet member who is suddenly appointed President of the United States after a catastrophic attack on the U.S. Capitol during the State of the Union, on the highly anticipated ABC series "Designated Survivor," airing WEDNESDAY, SEPTEMBER 21 (10:00—11:00 p.m. EDT), on the ABC Television Network. In this dramatic thriller, Kirkman will struggle to keep the country and his own family from falling apart, while navigating the highly volatile political arena and while leading the search to find who is responsible for the attack. 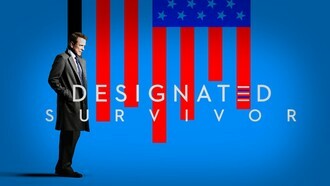 "Designated Survivor" stars Kiefer Sutherland as Tom Kirkman, Natascha McElhone as Alex Kirkman, Adan Canto as Aaron Shore, Italia Ricci as Emily Rhodes, LaMonica Garrett as Mike Ritter, Kal Penn as Seth Wright, and Maggie Q as Hannah Wells. Guest starring Tanner Buchanan as Leo Kirkman, McKenna Grace as Penny Kirkman, Kevin R. McNally as Harris Cochrane, Malik Yoba as Jason Atwood, Arjay Smith as Nolan, Alex Quijano as Lawrence, Richard Bekins as President Richmond, Elias Zarou as Ambassador Ahmed Fayad, Peter Outerbridge as Charlie Langdon, Rothaford Gray as Acting Defense Secretary, Krista Morin as Acting FBI Director, Catherine Tait as Acting Health & Human Resources Secretary, Matthew Olver as Acting Transportation Secretary, Michael Kinney as Acting Treasury Secretary, Dan MacKay as Air Force Major, Doug MacLeod as Acting Secretary of State, Robin Cunningham as Major Scott Cameron, Darlene Cooke as DC Appellate Judge, and Tyler Burton as Caleb West. "Pilot" was written by David Guggenheim and directed by Paul McGuigan. "Designated Survivor" is from The Mark Gordon Company and ABC Studios. David Guggenheim is the creator and executive producer. Executive Producers of "Pilot" are Simon Kinberg, Mark Gordon, Jon Harmon Feldman, Nick Pepper, Suzan Bymel, Aditya Sood, Amy Harris and Kiefer Sutherland. PRESIDENT KIRKMAN STEPS INTO THE ROLE OF COMMANDER-IN-CHIEF BEFORE LEARNING THE SHOCKING NEWS THAT HE WASN'T THE ONLY DESIGNATED SURVIVOR, ON ABC'S "DESIGNATED SURVIVOR"
"The First Day" – Hours after the attack on the Capitol, President Kirkman steps into his role as Commander-in-Chief in the midst of chaos and confusion. Facing dangerous new challenges and adversaries, Kirkman struggles to hold a country together that is on the brink of falling apart. Virginia Madsen guest stars on the highly anticipated ABC series "Designated Survivor," WEDNESDAY, SEPTEMBER 28 (10:00–11:00 p.m. EDT). Guest-starring Bobby Brown as Secret Service Agent #5, Michael Gaston as Governor John Royce, Zahir Gilani as Reporter, Mckenna Grace as Penny Kirkman, David Ingram as Deputy Secretary of Transportation, Michael Murray Scratch as Senator Scott Wheeler, and Nicole Stamp as Reporter. "The First Day," was written by Jon Harmon Feldman and David Guggenheim. Brad Turner is the director. THE FBI CONTINUES TO INVESTIGATE THE CAPITOL BOMBING, WHILE PRESIDENT KIRKMAN DEALS WITH A HIGH-LEVEL SECURITY BREACH AND PREPARES FOR HIS FIRST TELEVISION INTERVIEW, ON ABC'S "DESIGNATED SURVIVOR"
"The Confession" – President Kirkman and his staff work to keep a high-level security breach of the White House a secret just as he's about to give his first television interview. Meanwhile, the FBI continues to investigate the Capitol bombing, and Agent Hannah Wells starts to develop her own theories about who was really behind the attack, on ABC's "Designated Survivor," WEDNESDAY, OCTOBER 5 (10:00—11:00 p.m. EDT). Guest Starring are Virginia Madsen as Congresswoman Kimble Hookstraten, Kevin R. McNally as Harris Cochran, and Elizabeth Vargas as Herself. "The Confession" was written by Jennifer Johnson and Paul Redford. Sergio Mimca-Gezzan is the director. THE GROUP BEHIND THE CAPITOL ATTACK IS LOCATED, ON ABC'S "DESIGNATED SURVIVOR"
"The Enemy" – Kirkman learns who is behind the attack and needs to grapple not only with the prospect of war, but brewing domestic troubles as well. Kirkman taps Emily to monitor the domestic situation, while Alex may be in for more than she bargains for when she seeks out help from Hookstraten, on ABC's "Designated Survivor," WEDNESDAY, OCTOBER 12 (10:00—11:00 p.m. EDT). Guest starring are Virginia Madsen as Congresswoman Kimble Hookstraten and Kevin R. McNally as Harris Cochran. "The Enemy" was written by Dana Ledoux Miller & Jon Harmon Feldman. Paul Edwards is the director. "The Mission" – Realizing his attempts at diplomacy with Algeria have failed, President Kirkman makes the difficult decision of sending Navy SEALs on a mission that will define his presidency. Meanwhile, as the investigation into the Capitol bombing continues, Agent Hannah Wells discovers more secrets than answers, on ABC's "Designated Survivor," WEDNESDAY, OCTOBER 26 (10:00—11:00 p.m. EDT). Guest-starring are Vanessa Bal as Young Girl, Vanessa Burns as Shelly, Lara Jean Chorostecki as Beth MacLeish, Peter Loung as SEAL 1, Alex Mallari Jr. as Chief Edward Marino, Nicholas Massouh as Majid Nassar, David Alexander Miller as Brian, Rhys Wyn Trenhaile as Duty Officer Sanders, and Ashley Zukerman as Peter MacLeish. "The Mission" was written by Sang Kyu Kim & Michael Russell Gunn. Paul Edwards is the director. SHOTS ARE FIRED DURING A GOVERNORS SUMMIT AT THE WHITE HOUSE WHILE AGENT WELLS MAKES A SHOCKING DISCOVERY ABOUT THE CAPITOL BOMBING, ON ABC'S "DESIGNATED SURVIVOR"
"The Interrogation" – When shots ring out at The White House during a Governors Summit, President Kirkman's plans at electing a new Congress are thrown into turmoil, while Agent Hannah Wells continues investigating the Capitol bombing and makes one of her most shocking discoveries yet on ABC's "Designated Survivor," WEDNESDAY, NOVEMBER 9 (10:00—11:00 p.m. EST). Guest-starring Vanessa Burns as Reporter #2, Lara Jean Chorostecki as Beth MacLeish, Zahir Gilani as Reporter, Nick Massouh as Majid Nassar, David Norona as Governor Rivera, Melanie Scrofano as Lisa Jordan, Rhys Wyn Trenhaile as Duty Officer Sanders, and Ashley Zukerman as Peter MacLeish. "The Interrogation" was written by Barbie Kligman & Jenna Richman. Michael Katleman is the director. PRESIDENT KIRKMAN NEGOTIATES AN AMERICAN HOSTAGE EXCHANGE WHILE HANNAH AND FBI DEPUTY DIRECTOR ATWOOD UNCOVER INFORMATION THAT PUTS BOTH THEIR LIVES IN DANGER, ON ABC'S "DESIGNATED SURVIVOR"
"The Traitor" – When an American track-and-field coach heads to Russia, President Kirkman is thrust into a hostage exchange involving the CIA and the Russian government. Meanwhile, Agent Hannah Wells and Deputy Director Atwood's investigation into the Capitol bombing uncovers information that puts Atwood and his family's life at risk, on ABC's "Designated Survivor," WEDNESDAY, NOVEMBER 16 (10:00—11:00 p.m. EST). "Designated Survivor" stars Kiefer Sutherland as Tom Kirkman, Natascha McElhone as Alex Kirkman, Adan Canto as Aaron Shore, Italia Ricci as Emily Rhodes, LaMonica Garrett as Mike Ritter with Kal Penn as Seth Wright, and Maggie Q as Hannah Wells. Guest-starring Vanessa Burns as Reporter #1/Shelly, Lara Jean Chorostecki as Beth MacLeish, Enrico DiFede as Cop, Mckenna Grace as Penny Kirkman , Dwight Ireland as Reporter, Matthew MacFadzean as Tim Beck, Nicholas Massouh as Majid Nassar, Michael James Regan as Duty Officer, Melanie Scrofano as Lisa Jordan, and Ashley Zukerman as Peter MacLeish. "The Traitor" was written by Jennifer Johnson & Michael Russell Gunn. Fred Toye is the director. Emergency plans in the event that the presidential line of succession is threatened; real-life designated survivors, Dan Glickman and Gale Norton; actors Kiefer Sutherland and Kal Penn; the Smolensk air disaster; the Reagan assassination attempt. A NATIONAL EMERGENCY CAUSES KIRKMAN TO CONSIDER CANCELLING THE HOUSE ELECTIONS, ON ABC'S "DESIGNATED SURVIVOR"
"The Results" – On the eve of the country voting to elect a new House of Representatives, an unexpected development forces Kirkman to consider cancelling the elections entirely. Meanwhile, news has leaked about Majid Nassar's death, and Kirkman has to handle the fallout, on ABC's "Designated Survivor," WEDNESDAY, NOVEMBER 30 (10:00–11:00 p.m. EST). Guest starring Elana Dunkelman as Natalie/Reporter #2, Daniel Maslany as Jared Kaplan, Ashleigh Rains as Mindy's Daughter, Melanie Scrofano as Lisa Jordan, Michael Therriault as Dr. Arnold, Ashley Zukerman as Peter MacLeish, and Virginia Madsen as Kimble Hookstraten. "The Results" was written by Paul Redford & Sang Kyu Kim. Chris Grismer is the director. "The Blueprint" – When classified government documents are leaked online, President Kirkman searches for the party responsible only to find that they have taken refuge inside a foreign embassy and are behind even his reach. Meanwhile, Agent Hannah Wells races furiously to gather evidence of MacLeish's involvement in the conspiracy before he can be confirmed as the country's next Vice President, on ABC's "Designated Survivor," WEDNESDAY, DECEMBER 7 (10:00–11:00 p.m. EST). Guest starring Ashley Zukerman as Peter MacLeish, Reed Diamond as John Forstell, John Bourgeois as Senator Hazelton, Lara Jean Chorostecki as Beth MacLeish, Virginia Madsen as Kimble Hookstraten, Jeff Clarke as Congressman Kevin George, Jake Epstein as Chuck Russink, Richard Waugh as Jay Whitaker, Elana Dunkelman as Natalie, Alicia Nieves as New Anchor #1, Scott Schaffer as New Anchor #2, Joanne Boland as Sarah Lassiter, Vanessa Burns as Shelly, Matthew MacFadzean as Tim Beck, Sean Francis as Veteran #1, Alexander Troy as Veteran #2, Andrew Zachar as Veteran #3, Jeff Lillico as Wyatt, and Brent Sexton as Gabriel Thompson. "The Blueprint" was written by Dana Dedoux Miller & Michael Russell Gunn. Richard J. Lewis is the director. PRESIDENT KIRKMAN WORRIES THERE COULD BE A TRAITOR IN THE WHITE HOUSE, ON ABC'S "DESIGNATED SURVIVOR"
"The Oath" – President Kirkman fears there could be a traitor in the White House when he discovers shocking information connected to the Capitol Bombing. Confiding in Emily, Kirkman puts her in charge of quietly investigating. Meanwhile, new information surfaces about Congressman MacLeish, raising concerns regarding his vice presidential nomination, on ABC's "Designated Survivor," WEDNESDAY, DECEMBER 14 (10:00–11:00 p.m. EST). Guest-starring Vanessa Burns as Shelly, Lara Jean Chorostecki as Beth MacLeish, Elana Dunkelman as Natalie, Jack Murray as The Bystander, Melanie Scrofano as Lisa Jordan, Ashley Zukerman as Peter MacLeish, Virginia Madsen as Kimble Hookstraten, and Kevin R. McNally as Harris Cochrane. "The Oath" was written by David Guggenheim. Fred Toye is the director. THE NATION REELS FROM THE AFTERMATH OF THE SHOOTING ON THE STEPS OF THE CAPITOL, ON ABC'S "DESIGNATED SURVIVOR"
Guest-starring Glenda Braganza as Rakhi Patel, Vanessa Burns as Shelly, Lara Jean Chorostecki as Beth MacLeish, Elana Dunkelman as Reporter #3/Natalie, Mckenna Grace as Penny Kirkman, Mary Grant as Trauma Team, Jean Paul Najm as Secret Service Agent #1, and Ashley Zukerman as Peter MacLeish. "Warriors" was written by Paul Redford and Carol Flint. Stephen Surjik is the director. AS LOYALTIES CONTINUE TO GET TESTED, AGENT HANNAH WELLS UNCOVERS ANOTHER PIECE OF THE CONSPIRACY, ON ABC'S "DESIGNATED SURVIVOR"
"The End of the Beginning" – Circles must tighten as a new discovery within the conspiracy emerges. Meanwhile, tension rises between Aaron and Emily as suspicions loom in the White House. A new lead places Agent Wells closer than before to the truth, on ABC's "Designated Survivor," WEDNESDAY, MARCH 15 (10:00 – 11:00 p.m. EDT). Guest-starring Lara Jean Chorostecki as Beth MacLeish, Mckenna Grace as Penny Kirkman, Mary Grant as Trauma Team, Daren A. Herbert as Alvin Joyner, and Ashley Zukerman as Peter MacLeish. "The End of the Beginning" was written by David Guggenheim. Mike Listo is the director. A LEAK TO THE PRESS THROWS THE WHITE HOUSE INTO TURMOIL, AS THE CONSPIRACY HITS CLOSE TO HOME, ON ABC'S "DESIGNATED SURVIVOR"
"Backfire"— An investigative journalist shocks the White House when he reveals classified information during a press briefing and leaves Seth struggling to contain the damage from the leaked story. Meanwhile, Hannah unearths a key connection between MacLeish and the conspiracy, on ABC's "Designated Survivor," WEDNESDAY, MARCH 22 (10:00–11:00 p.m. EDT). Guest-starring Michelle Alexander as Laura, Michael Brown as Ollie Vega, Vanessa Burns as Shelly, Allison Feliciano as AIDE, Darryl Flatman as Cop #1, Mckenna Grace as Penny Kirkman, Daren A. Herbert as Alvin Joyner, Darrell Hicks as Secret Service. Cory Lee as Callie Song, and Vincent Marciano as White House Producer. "Backfire" was written by Sang Kyu Kim & Pierluigi D. Cothran. Tara Nicole Weyr is the director.